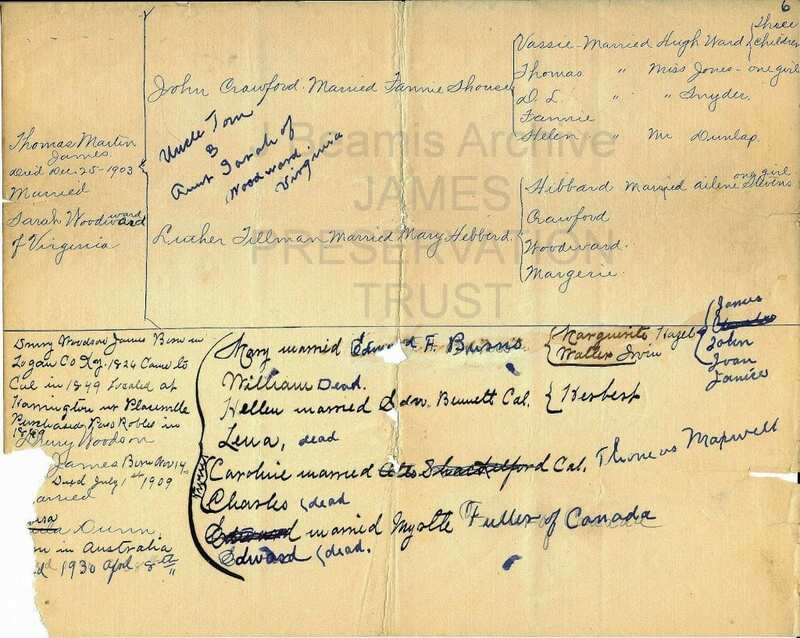 Who wrote the Jesse James family tree? The story of the Jesse James family tree discovery is told in the opening chapter of Jesse James Soul Liberty, Vol. I, Behind the Family Wall of Stigma & Silence. 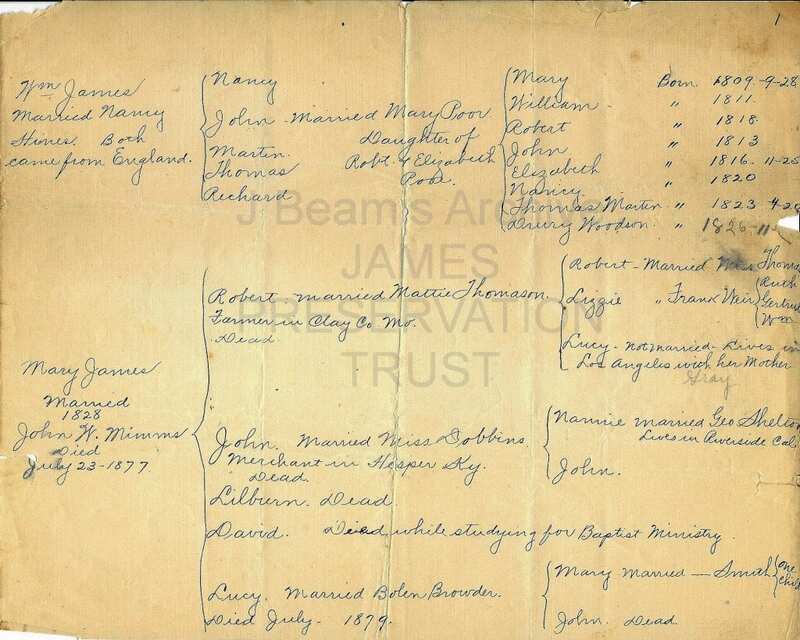 Joan Beamis found the family tree among the artifacts of Mary Louisa James-Burns. Joan called her grandmother Mary Louisa, Nanna. Joan’s great grandfather is Drury Woodson James, an uncle of Frank & Jesse James. Nanna is his daughter. The finding of the family tree following Nanna’s death left Joan with the lingering question. 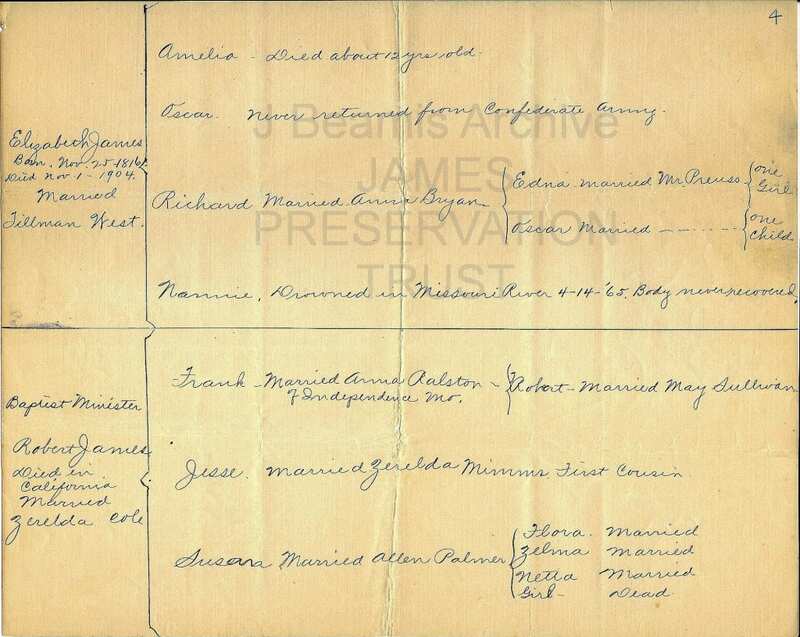 Page 6 of the Jesse James family tree found by Joan Beamis. The family tree was declared as inadmissible evidence for genealogical purposes by the D.A.R. Registrar’s Office when offered as partial proof when I was searching my papers for membership in the D.A.R. I could not say who wrote it, when it was written, or by whom it was written. Rejection imprint received by Joan Beamis from the Daughters of the American Revolution. My grandmother, Mary James Burns (Mrs. Edward F.) never talked about her James connections even with her own grandchildren; and we were grown men and women when my father inadvertently let it slip. (He had to forbid us to mention anything about it to Nanna.) My one thought now, is, that Nanna, seventeen years in her grave next June, would have enjoyed my research as much as I have. 1. Evidently written by someone in Kansas City because the exact birth date and death dates are given only for Mary, Elizabeth, and Thomas Martin. 2. 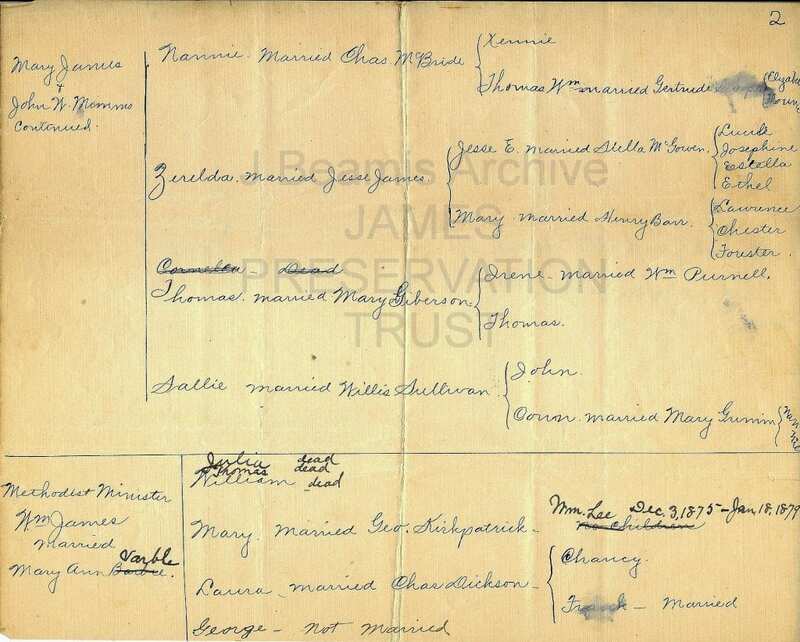 It might possibly have been one of Mary James Mimms’ children because the only wedding date is that of the mother and father – 1828. 3. It was evidently written expressly for my grandmother because all vital information and statistics about Drury Woodson James were left for her to fill in. With the exception of his name and his wife’s name, and that was written Lula instead of Louisa. 4. 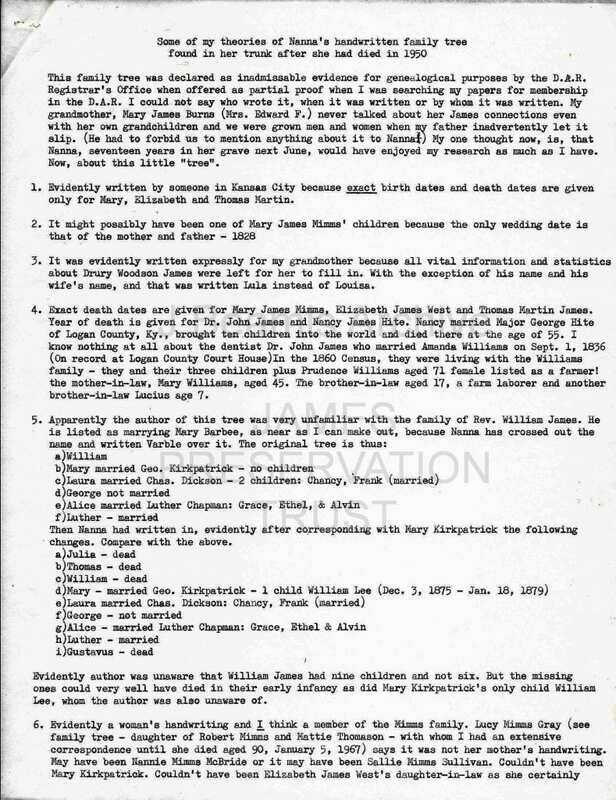 Exact death dates are given for Mary James Mimms, Elizabeth James West, and Thomas Martin James. Year of death is given for Dr. John James and Nancy James Hite. Nancy married Maj. George Hite of Logan County, Ky., brought ten children into the world and died there at the age of 55. I know nothing at all about the dentist Dr. John James who married Amanda Williams on Sept. 1, 1836 (On record at Logan County Court House). In the 1860 Census, they were living with the Williams family – they and their three children plus Prudence Williams aged 71 female listed as a farmer! the son-in-law, Mary Williams, aged 45. The brother-in-law aged 17, a farm laborer and another brother-in-law Lucius age 7. Then Nanna had written in, evidently after corresponding with Mary Kirkpatrick the following changes. Compare with the above. Evidently, the author was unaware that William James had nine children and not six. But the missing ones could very well have died in their early infancy as did Mary Kirkpatrick’s only child William Lee, whom the author was also unaware of. 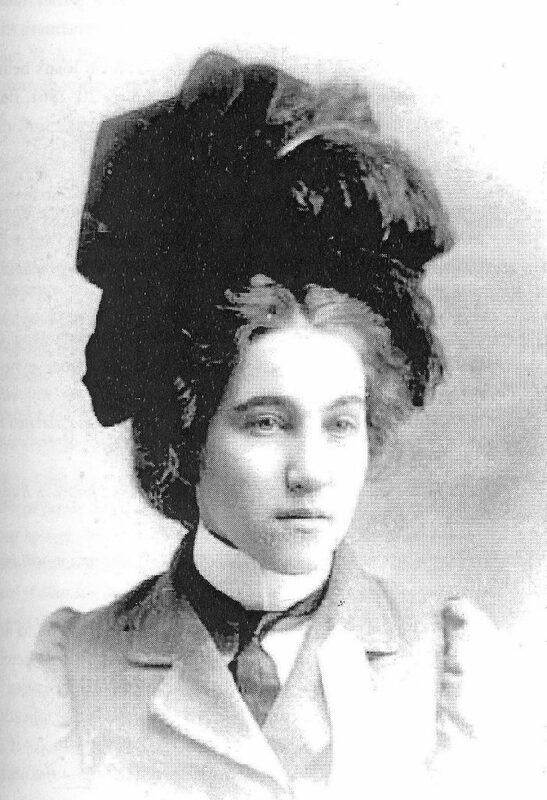 Lucy Ethel Mimms-Gray, called Ludie, was a lifelong school teacher. 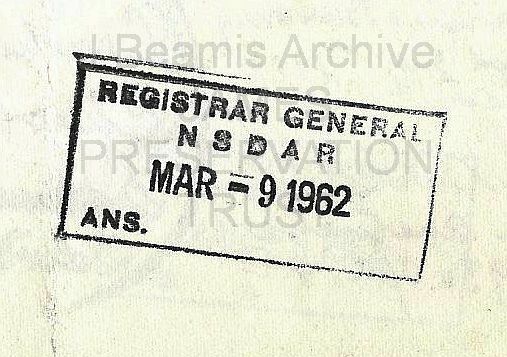 She also was a member of the DAR who helped Joan Beamis acquire her DAR membership via their Mimms ancestry. 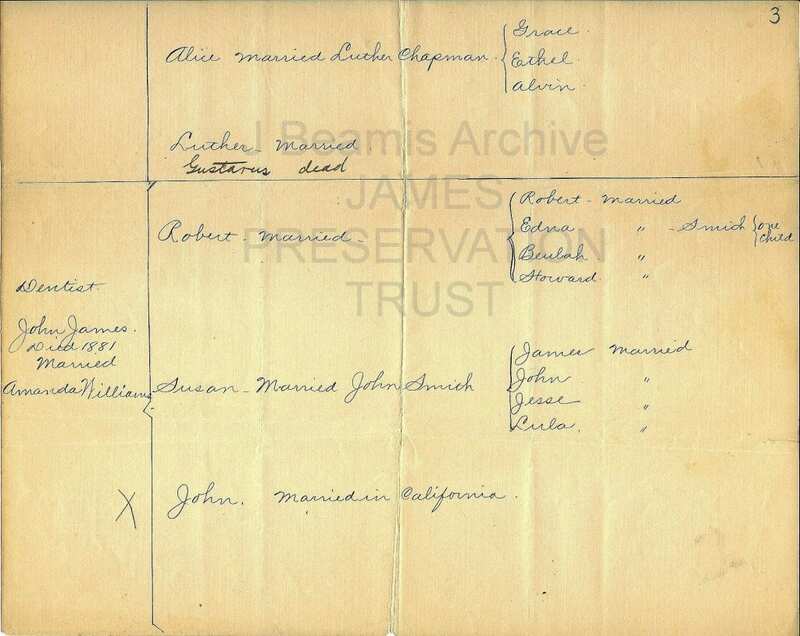 Ludie also is a James descendant through her great-grandparents John M. James & Mary “Polly” Poor. 6. Evidently, a woman’s handwriting and I think a member of the Mimms family. 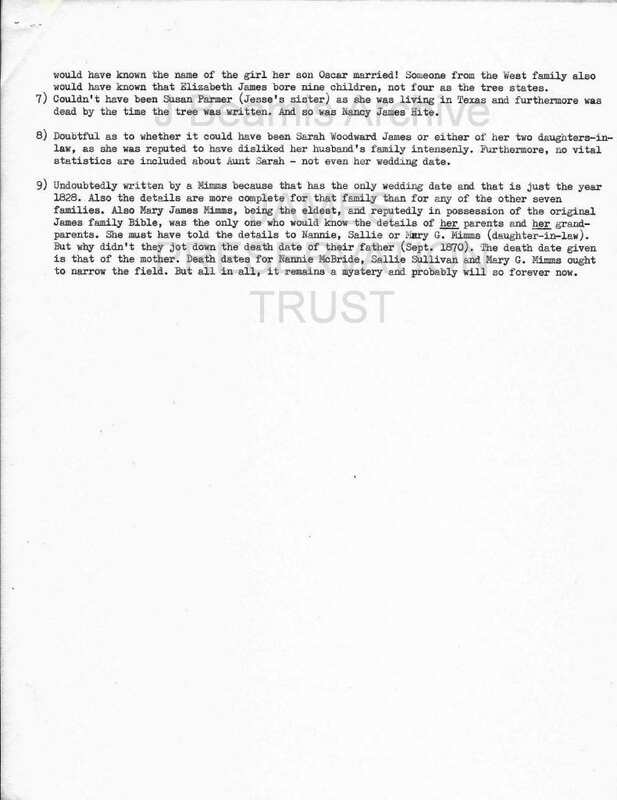 Lucy Mimms Gray (see the family tree – a daughter of Robert Mimms and Mattie Thomason – with whom I had an extensive correspondence until she died age 90, January 5, 1967) says it was not her mother’s handwriting. May have been Nannie Mimms McBride or it may have been Sallie Mimms Sullivan. Couldn’t have been Mary Kirkpatrick. Couldn’t have been Elizabeth James West’s daughter-in-law as she certainly would have know the name of the girl her son Oscar married! Someone from the West family also would have known that Elizabeth James bore nine children, not four as the tree states. 7) Couldn’t have been Susan Parmer (Jesse’s sister) as she was living in Texas and furthermore was dead by the time the tree was written. And so was Nancy James Hite. 8) Doubtful as to whether it could have been Sarah Woodward James or either of her two daughters-in-law, as she was reputed to have disliked her husband’s family intensely. Furthermore, no vital statistics are included about Aunt Sarah – not even her wedding date. 9) Undoubtedly written by a Mimms because that has the only wedding date and that is just the year 1828. Also, the details are more complete for that family than for any of the other seven families. Also Mary James Mimms, being the eldest, and repeatedly in possession of the James family Bible, was the only one who would know the details of her parents and her grandparents. She must have told the details to Nannie, Sallie, or Mary G. Mimms (daughter-n-law). But why they didn’t jot down the death date of their father (Sept. 1870). The death date given is that of the mother. 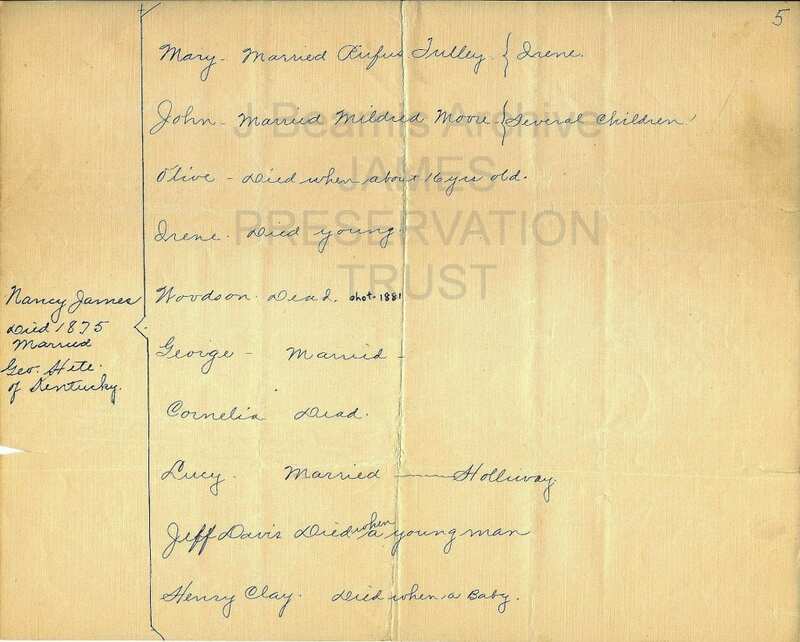 Death dates for Nannie McBride, Sallie Sullivan, and Mary G. Mimms ought to narrow the field. But all in all, it remains a mystery and probably will so forever now.